Model information: Breyer Fighting Stallion mold; #702797 "Poncho Rex", special run for the 1999 West Coast Model Horse Collectors Jamboree; 1,500 made. 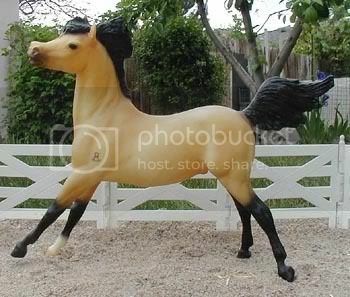 Model information: Breyer "Smoky" mold; #993 "Shenandoah," Mustang, produced January-June 1997. This model is extra special to me as it was my winning design for the JAH coloring contest waaaayyyy back in 1996! This is an odd variation with a solid-colored face, rather than a large blaze. I know of one other solid-faced model. 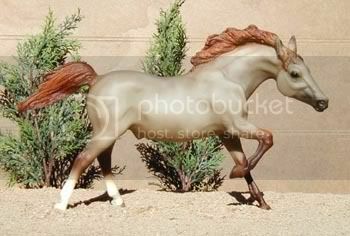 Model information: Breyer Running Stallion mold; Wildfire's Fury, special run for State Line Tack stores in 1998. 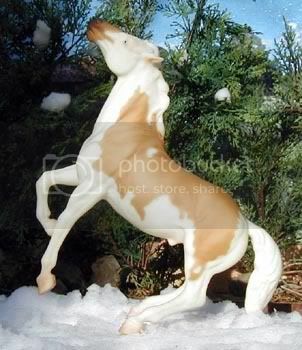 Model information: Breyer Fighting Stallion mold; #410184 Fighting Stallions Set, special run for the 2004 JCPenney holiday catalog. 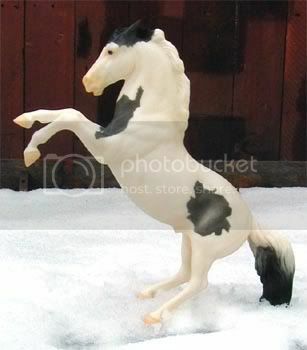 Model information: Breyer "Smoky" mold; #993 "Shenandoah," Mustang, produced January-June 1997. This is the version with normal black eyes. 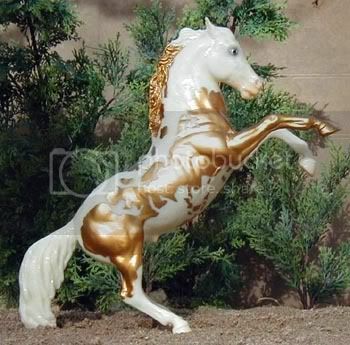 Model information: Breyer Running Stallion mold; #707598 Cowboy Pride 3-Piece Horse Set, special run for the 1998 JCPenney holiday catalog. 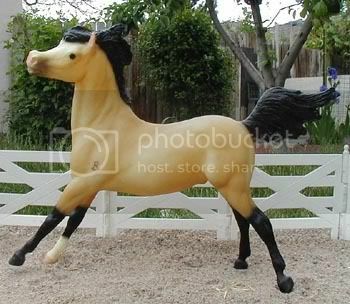 Model information: Breyer Running Stallion mold; #126 Running Stallion, produced 1968-1971. 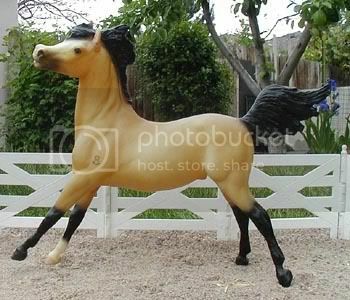 Model information: Breyer Mustang mold; #701496 Amerigo, special run for the 1996 Equitana USA event, 1,000 made. His pattern represents an old map of North America. 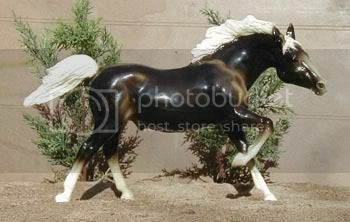 Model information: Breyer Fighting Stallion mold; #701400 Atlas, special run for the 2000 Equitana USA event, 2,500 made. He carries a map of the world. 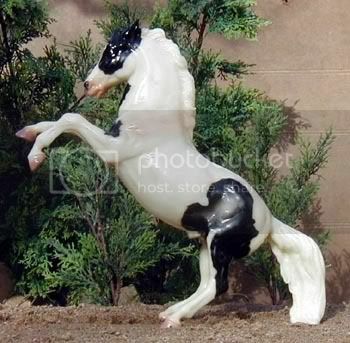 Model information: Breyer "Smoky" mold; #993 "Shenandoah," Mustang, produced January-June 1997. 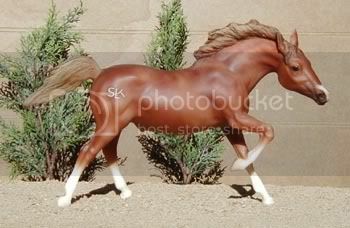 This is the version with hand-painted bi-colored eyes, an early Breyer experiment that didn't turn out very well as many models ended up with "snake eyes."